First, examine a hand specimen of the Rhynie Chert (VG 1:12). Chert is a finely crystalline silica that commonly forms in association with hot springs. Exactly how the Rhynie Chert of Scotland formed is still questionable, but it clearly represents an autochthonous deposition of plants in a swampy setting. Because of apparent rapid preservation by pulses of silica-bearing water, the Rhynie Chert preserves Early Devonian land plants in exquisite detail. How were these rocks formed? What type of preservation do they represent? What sort of anatomical and morphological features might you expect to see in the Rhynie plants? What features of the deposit suggest that the plant remains are an autochthonous (buried in place) rather than an allochthonous (transported to the site of burial)? The Rhynie Chert preserves a variety of plants apparently growing together in an ancient community. Among them are Horneophyton, Aglaophyton, Rhynia and Asteroxylon. We will discuss the first three this week and save Asteroxylon for next week, when we discuss other members of its clade. Horneophyton, Aglaophyton, and Rhynia are all small plants, lacking leaves and roots, and bearing terminal sporangia on branching axes. Aglaophyton The plant formerly known as Rhynia major (Aglaophyton major) (Figure 4.5)(VG 1:13) is approximately 18 cm in height and branches dichotomously. It appears to have a creeping rhizome. Sporangia are fusiform (Figure 4.5c) with the suggestion of a slight twist at the base. Figure 4.5: Aglaophyton major. (A) Whole plant reconstruction showing rhizome and vertical axes. (B) Cross section showing "protostele", (C) sporangium in longitudinal section with spores inside. (D) Lyonophyton rhyniensis, the suggested gametophyte of Aglaophyton. Aglaophyton was removed from the genus Rhynia because the structures originally interpreted as tracheids in a central vascular strand, turned out on closer examination to be conducting tubes more like those of some mosses. Since unornamented conducting tubes would be plesiomorphic to the land plants, this character does not ally Aglaophyton with the moss lineage directly but does suggest a close sister-group relationship. Also, the main plant body of Aglaophyton is clearly a free-living sporophyte (sporangia are attached). 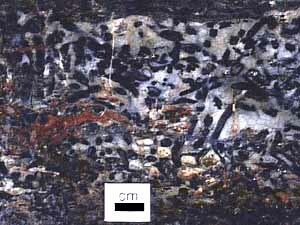 The gametophyte of Aglaophyton appears to be Lyonophyton (Figure 4.5d), another Rhynie Chert plant with naked axes and dichotomous branches; these branches terminate in antherida. Lyonophyton has some sort of conducting strand at the center of its axis, but the nature of the tubes (tracheids or no) is questionable. The two generations are linked together by shared epidermal features, which-as you remember from Laboratory III-carries intermediate weight of inference. If this plant truly has two independent free-living and morphologically similar generations, it takes an important place in plant life cycle evolution. Horneophyton (Figure 4.6)(VG 1:14) is a vascular plant with dichotomously-branched above-ground axes that terminate in sporangia. This plant differs from all other Rhynie Chert plants in having a corm-like base bearing numerous rhizoids. The vascular strand of Horneophyton becomes indistinct as it approaches the base of the plant and disappears altogether in the corm-like structure. Sporangia (Figure 4.6c) are cylindrical and branched, which also distinguishes this plant from all other Rhynie Chert taxa. 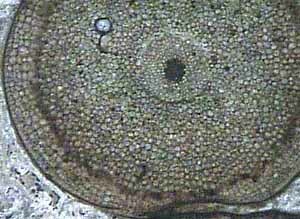 The sporangia have a central column similar to that of some moss, but the clearly developed tracheids in the center of Horneophyton's axis (a derived state) remove it from the moss lineage. Furthermore, Horneophyton also appears to have a free-living gametophyte, Langiophyton (Figure 4.6d). Although poorly known, this vascular plant was probably about 6 cm tall with cup-like terminal structures bearing archegonia. Horneophyton and Langiophyton are linked by epidermal features and the detail of conducting cells. Figure 4.6: Horneophyton lignieri. (A) Whole plant reconstruction; (B) schematic protostele; (C) sporangia. (D) Langiophyton mackiei, the suggested gametophyte of Horneophyton. Rhynia (Figure 4.7) is also a vascular plant, somewhat monopodial branching to a height of about 18 cm. Upright axes branched from horizontal rhizomes that bore delicate rhizoids. Small bumps are noted along the axis, some of which may contain archegonia. Rhynia gwynne-vaughanii has a distinct protostele composed of distinct phloem and only a handful of xylem cells. The cortex is composed of parenchyma with abundant air spaces that resemble the spongy mesophyll of leaves and so may have functioned for photosynthesis. Sporangia are generally fusiform and located at branch tips. The presence of terminal sporangia and possible archegonia on the same plant have raised the possibility of a bryophyte-like life history. However, there is no structural evidence of a transition between sporophyte and gametophyte and the morphological relationship between the purported archegonia-bearing structures and the rest of the plant remain unclear. Further study will be needed to clarify Rhynia's contribution to our understanding of early land plant life cycle evolution. Figure 4.7: Rhynia gwynne-vaughanii. (A) Whole plant reconstruction, and (B) schematic protostele in transverse section. Also in lab this week is the living plant Psilotum. Psilotum was originally classified in its own major group. Because of its very simple morphology (nearly dichotomous branching, protostele, lack of leaves and simple sporangia), many botanists believed that it is a survivor of the very primitive lineages of plants like those of the Rhynie Chert. Recent molecular analyses suggest strongly that Psilotum is allied with the most basal ferns. However, this conclusion is still debated on morphological grounds. If Psilotum is related most closely to ferns, several interesting questions emerge: What morphological homologies are possible between Psilotum and purported fern sister taxa? What are the developmental genetic changes that led to the stark changes in morphology? If the relationships suggested by the molecular phylogenies are correct, Psilotum may offer a tool for thinking about the morphological consequences of adding leaves to the simple axes of Early Devonian plants. The excellent, in-situ preservation of the Rhynie Chert has offered us more than just a detailed look at the plants themselves. Through the Rhynie Chert, we see which plants were living together and get some idea of how many taxa grew together in a community. Since both sporophytes and gametophytes are present, some inference about life history evolution is possible. We also see other organisms that were living with the Rhynie Chert plants including a variety of arthropods. These small animals probably fed on decaying plant material although there is some suggestive evidence of animal attack on living plants. A fungus, Paleomyces, is also found infecting the soft tissues of the Rhynie Chert plants. It remains unclear whether Paleomyces was a decomposing organism, feeding on dead plant material, a parasite or a mycorrhizal symbiont. Some theoretical work suggests that mycorrhizal symbiosis might have helped early land plants solve the problems associated terrestrial life. However, many of these ideas await more detailed testing.